Searching for the right pillow for that perfect night of sleep? The answer may lie in the comfort of the new Everlay pillow. Everlay is fairly fresh to the bedding industry and recently launched their new pillow. This review is going to dive into the construction and materials of the pillow that advertises “ultimate rest” and put it to the Sleepopolis test. In addition to a material and construction quality evaluation, we’re also going to subject the Everlay pillow to our multi-night sleep test to see how it compares when the lights go out! Continue reading below for my full review of the Everlay pillow. Don’t have time to spare? Click here to jump straight to the review summary. The Everlay pillow is built with gel memory foams and aims to create a cooler feeling pillow while holding onto the traditional feel of memory foam. Memory foams will compress and cradle your head and neck. This feel, in part, results from the visco elastic properties of memory foam. Compression from viscoelasticity can lead to a warmer pillow because of the reduced airflow under your head and neck. The gel infused into the foam works simultaneously to dissipate body heat. By utilizing shredded foam, the Everlay pillow has a little more flexibility in shape and size. (Note: This is not an adjustable foam pillow.) Shredded foam also plays into the cooling aspect of the pillow by allowing for more airflow. Everlay doesn’t specifically reveal the material used in the cover, but it feels like some kind of quilted cotton. It is soft to the touch and feels breathable. As far as aesthetics, the design of the Everlay pillow is pretty straight forward. A wide and textured navy gusset runs along the sides to separate the all white top and bottom. The feel of this pillow is similar to a traditional memory foam, but different. 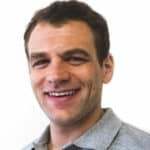 Using shredded memory foam versus a more traditional solid molded foam, allows more air to circulate through the pillow and helps to keep you cool through the night. The foam is fairly dense compared to many other foams I have tested, but it still retains a soft feel. FAQ: What’s the best neck pillow? 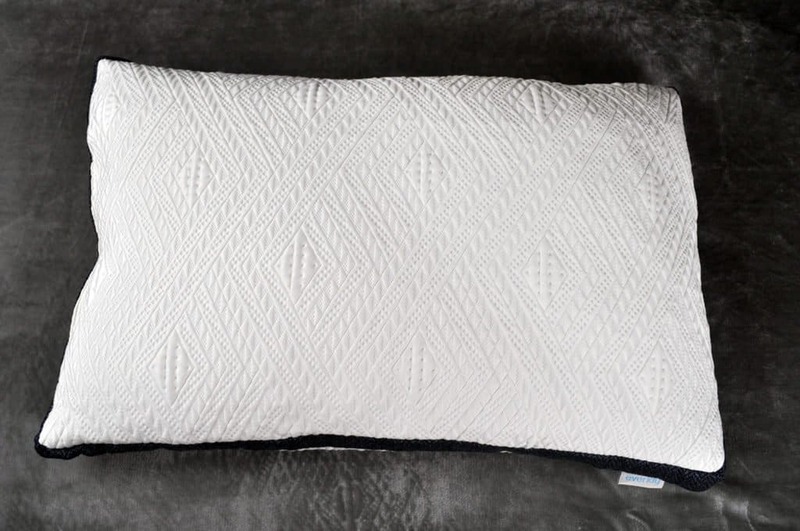 This pillow has a similar feel to many other pillows of similar make and design, but one thing to note about the Everlay pillow is that it is not adjustable. Should I Buy the Everlay pillow? All things considered, the Everlay is a nice shredded gel memory foam pillow. Its gel infused filling creates a moldable and cool pillow, while retaining the classic feel of a traditional memory foam. On the downside, this pillow may be hard to keepclean since it’s not machine washable. The manufacturer recommends completely replacing the pillow ever 6-12 months which would get very costly at $75-85 per pillow. To make a pillow last longer, consider adding a pillow cover. Want nice support – This foam has a slightly denser feel than other traditional memory foams I have tested. In addition, the navy gusset on the sides helps to provide additional support as your head sinks into the pillow. Want a cooler pillow – The use of gel infused shredded foam makes this pillow soft and relatively cool throughout the night. 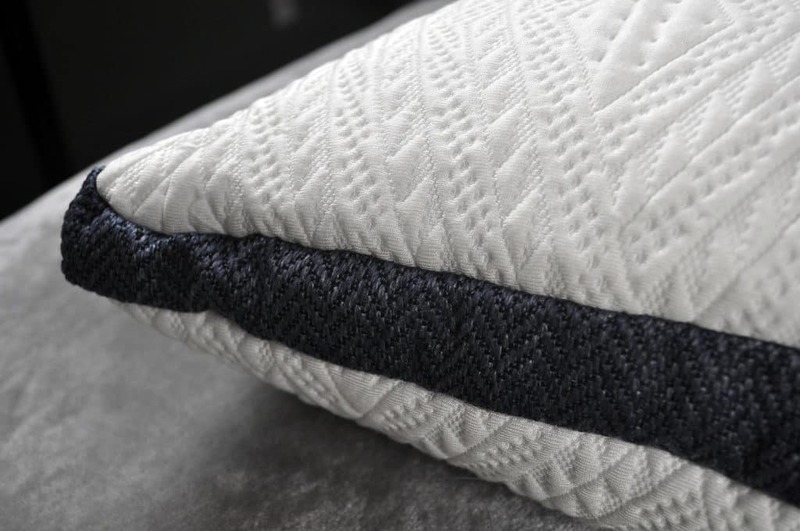 Want a thicker cover – Some sleepers prefer the feel of a thicker cover and if that’s you, you may really like the feel of the cover on the Everlay pillow. This thickness, again, contributes to the denser feel of this pillow. To learn more, check out the Everlay Pillow on Everlay.com. 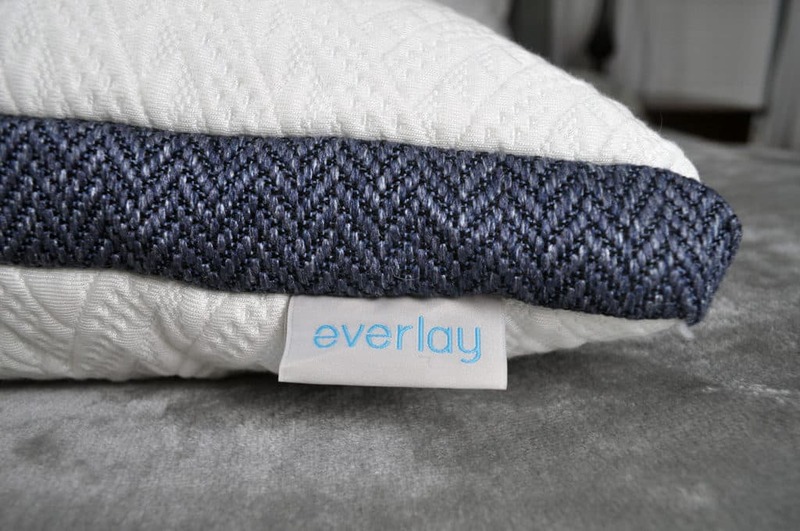 The Everlay pillow uses a shredded gel memory foam to provide the classic feeling of memory foam, but with enhanced cooling and better airflow. While not the coolest pillow I have tested to date, this pillow did have a nice feel to it and was very supportive. The side gusset that runs across the entirety of the pillow helps to provide additional support while you sleep.